Promoting Hip Hop music via word of mouth has been around since the beginning of Hip Hop. Every rapper has promoted new tracks, shows, and tons of other things via word-of-mouth. It’s not only an effective way to promote your music, it’s free as well. This is both a ‘pro’ and a ‘con’. If you’re promoting your music with effective word-of-mouth strategies, then you’re already familiar with how great it is. There’s always more people you can talk to and it cost you $0. However, if you’re using bad word-of-mouth techniques to promote your music, you’ll not only kill a lot of opportunities, you’ll also kill your credibility. So, to make sure you don’t waste time, kill opportunities, and kill your credibility, I’m going to give you 5 tips for promoting Hip Hop music via word-of-mouth. I get a lot of emails and Soundcloud links from artists trying to promote their music. Do you want to know the only thing worse than receiving a random Soundcloud link from someone? Receiving the Soundcloud link again, in a lousy follow-up email. There’s a thin line between being annoying and being a spammer. You want to avoid both, but being a spammer is a lot worse than being annoying. 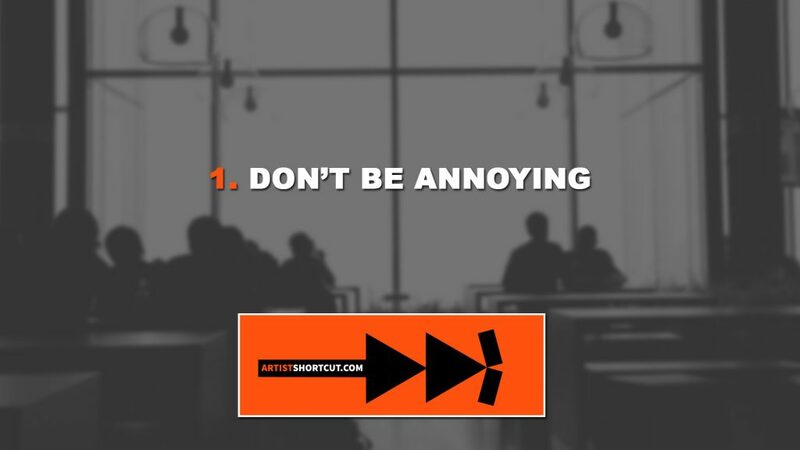 And, the more annoying you are, the more likely people will classify you as a spammer. I talk about this in my guest post on Hypebot. People love a good story, especially in Hip Hop. If you’ve done your homework and understand your target audience, your story will help you create and build a personal connection; as well as help you gain new listeners and fans. If I were to place two different Hip Hop artist that you’ve never heard of, side by side and told you to choose one, who would you choose? Your answer was probably “I don’t know” and that’s the right answer. How would you know who to choose? In your eyes, both of them are the same. But, what if we told you one of the artist’s background? Is it likely that you’ll choose the artist that you know more about if you’re remotely interested in that story? I think so. The moral of that example is that, when trying to separate yourself from other artists, just having a story will put you ahead of artists that don’t have one, if you’re targeting is correct . I’ve got one more example for you. Imagine we have two Hip Hop artists side by side and want you to choose one (again). This time, both artists have good stories and overall branding. Which one would you choose? If your answer was ‘Whichever one I like the most’, you’re correct. If both, you and your competition have good stories and overall branding, the one whose story and branding best fits that audience, will “win”. This is before the audience even listens to your music. The moral of this example, make sure your story fits the audience you’re going after. There are so many people in this Hip Hop industry with bad intentions that it’s almost scary. Want to know the good thing about having so many people with bad motives in this industry? The genuine people with good intentions will stand out. 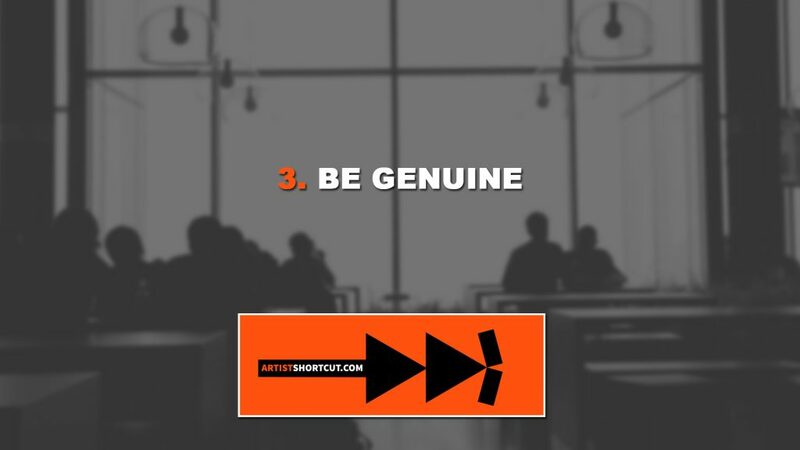 People can spot fakes from a mile away and if you’re known for having bad intentions, not only will your reputation begin to go sour, but your pockets are going to start getting hungry as well. Nobody wants to work with a dishonest person. And, once you build a reputation of dishonesty, the opportunities that were once available will start to disappear. Don’t be afraid to just have a conversation that doesn’t involve you promoting your music. You don’t need to promote your music at every opportunity that pops up. Focus on building relationships with people. Because, the beautiful thing about building relationships in Hip Hop is that, if done correctly, they’ll end up listening to your music anyway. For example, if you’re at an event and you’re having a genuine conversation with people there, they’ll probably look you up online if they thought you were a cool person. Now, if your branding is consistent across your website and social media platforms, it’s likely they’ll end up listening to your music anyway. They won’t be listening to your music because you asked them to; they’ll be listening to your music because, they’re actually curious about you and your music. This is a form of indirectly promoting your music and it’s one of the more “natural” ways. Although it’s not the quickest strategy for building listeners, it does tend to create longer relationships and more loyal fans. Which, at the end of the day, is what you’re trying to get anyway. When promoting Hip Hop music via word-of-mouth, you have to interact with people. When interacting with people, you need to be memorable. In order to be memorable, you have to give them a reason to remember you. So, there you have it. Those are my 5 tips for promoting Hip Hop music using word-of-mouth. Hopefully, these tips have gotten your brain pumping and thinking about other ways you can promote your music with word-of-mouth. If you found this article helpful, please share this article on social media! The more shares we get, the more articles we post, and the more stuff you’ll learn. Leave a comment below if you have any questions or concerns. I’ll try to help out as best as I can. I am extremely grateful and thankful for these tips. Everything makes sense and I will definitely be using these techniques. God bless you and keep doing what you are doing . I wish you much success!